Square One | News and Features | Style Weekly - Richmond, VA local news, arts, and events. 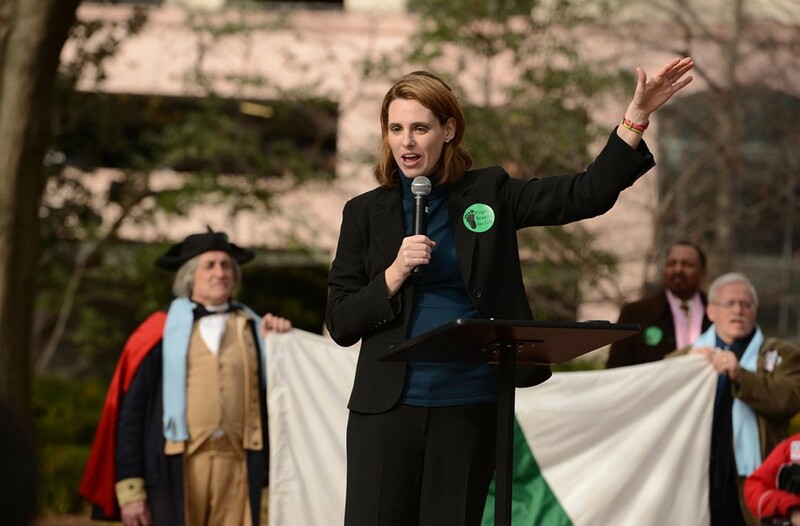 Victoria Cobb, president of the Family Foundation of Virginia, speaks to pro-life supporters in the Capital grounds. Hymns and saccharine keyboard music fill the lawn of the Capitol on opening day of the General Assembly session. The songs come courtesy of about 800 pro-life advocates rallying Jan. 9 to show lawmakers support for their past and future efforts to tighten state laws governing abortions. A few hundred feet away, on the other side of the wrought-iron fence that surrounds the center of government in Virginia, a scrappier bunch of about 20 pro-choice activists chant on the sidewalk and hold signs. One, scrawled on white poster board, says it all: "We're back." Activists from both sides of what's now a familiar debate say they want to make one thing clear from the first day of the session: They're watching and they want action. But inside the Capitol, abortion isn't up for discussion — at least publicly among the Republican leadership. When Gov. Bob McDonnell gives his State of the Commonwealth address a few hours later, he outlines his final legislative agenda: transportation, education and the economy. Social issues don't come up. Yes, proposed bills have been filed by lawmakers on both sides of the abortion debate, but McDonnell, who was tagged with the nickname Trans-vaginal Bob as a result of an ultrasound bill that made national headlines last time around, is likely to steer clear of anything resembling a penetrating wand in 2013. "After last year, there is more of an interest in the GOP leadership in having more message discipline coming out of the General Assembly session," longtime political analyst and consultant Bob Holsworth says. Quentin Kidd, a professor of political science at Christopher Newport University, says Republicans will work harder to keep social issues from dominating the session, especially with a gubernatorial election looming. "I think the leadership is going to try to not let it get out of their control," Kidd says. "I expect a much tighter-run ship." That doesn't mean every pro-life member of the House is planning to keep a lid on it this session. Delegate Bob Marshall, R-Manassas, has filed a handful of bills that are all essentially aimed at blocking a federal measure that requires insurance plans to cover birth control, which Marshall refers to as "abortion pills." Women should pay out of pocket for those, he says. Another measure, proposed by one of Marshall's Republican colleagues, eliminates Medicaid funding for abortions "in cases in which a physician certifies that he believes that the fetus would be born with a gross and totally incapacitating physical deformity or mental deficiency." Marshall says that if the Republican leadership "has a heart," they'll take up the measures. Republicans ignore social issues at their peril, he says. "If they're going to ignore this and just think that economic wins, they should talk to Mitt Romney," Marshall says. "He tried that path and it didn't work." Pro-choice activists say they welcome the fight. "We certainly don't want to lose ground, but if the 2012 election taught legislators anything, it's that women are mad and they're defiantly standing up for their rights," says Tarina Keene, executive director of NARAL Pro-choice Virginia. "I don't see that changing anytime soon." Keene refers to a 13-point gender gap in Virginia's 2012 presidential election results, which she attributes to the high-profile ultrasound bill, which originally required women undergo invasive, vaginal ultrasounds prior to abortion procedures: The requirement eventually was nixed. Across the country, the gender gap was 18 points, the second largest margin since exit polls first starting keeping track of the figure in 1972. "If the anti-choice legislators really want to fight on implementing a bad policy then they're going to get it," Keene says. "We're all ready to go and we understand that bad policy has bad ramifications every day for women in the state of Virginia."